Do groundbreaking ideas start out that way? Or are there lessons learned, tests conducted and evolved strategies that steer an idea to phenomenal success? We pondered this as Basket board member Jeff Webber addressed the entire Basket team recently at an offsite summit. Webber has more than 20 years of experience as a successful tech start-up investor and close advisor. That’s likely why he can confidently stand in the back of a conference room at National Harbor, just south of Washington, D.C., wearing a Hawaiian shirt, khaki shorts and Birkenstocks and speak his mind with laser-sharp clarity about great ideas and how to propel them forward, and insert a little humor to talk about those not-so-great ideas too. Webber was referencing the origins of Basket when founders Neil Kataria and Andy Ellwood tested whether grocery delivery was the wave of the future. A few sweat-soaked stops later, the bigger light bulb hit: the future of grocery wasn’t delivery, it was the data, or giving the shopper the pricing information needed to make a better decision. If grocery shoppers had price and product information at their fingertips and could compare in-store and online prices from multiple local grocers, it could save money and time on every trip. And the ‘ah-ha’ moment took off. It’s the mission and belief for all of us #Basketeers who proudly work on behalf of the largest community of grocery shoppers in the world. In just months, we’ve doubled the size of our team, we’ve been featured on Steve Harvey’s daytime talk show STEVE, and we’ve added over 500,000 users who have helped to contribute over 18 billion dynamic prices, covering over 170,000 stores across the U.S.
For a company moving as fast as Basket, it’s important to heed the advice of the experts who have been around a block or two (or been up a few flights of steps). Webber offered three pieces of sage advice for success that we wanted to share. It’s been said never to underestimate the power of company culture. At Basket, that culture is built on transparency, trust, and community. We work on that vision and mission every day. And it all starts with open communication (which, to be fair, isn’t difficult since we sit so close to one another!). There is also respect among our team members, from across levels and diverse backgrounds, that our continued cooperation is the only way to thrive. Within these values is an inherent vibrancy and fun. Our walls are colorful and motivating. Framed quotes say, “You Got This,” or “Be Kind” and “Great Things Never Came from Comfort Zones.” The generous supply of snacks gives a burst of energy. Our policy on attire is … well… comfy. Need a vacation? Take it. Just hustle to get your work done before and after. Need to work from home? Good, just let people know how to reach you. 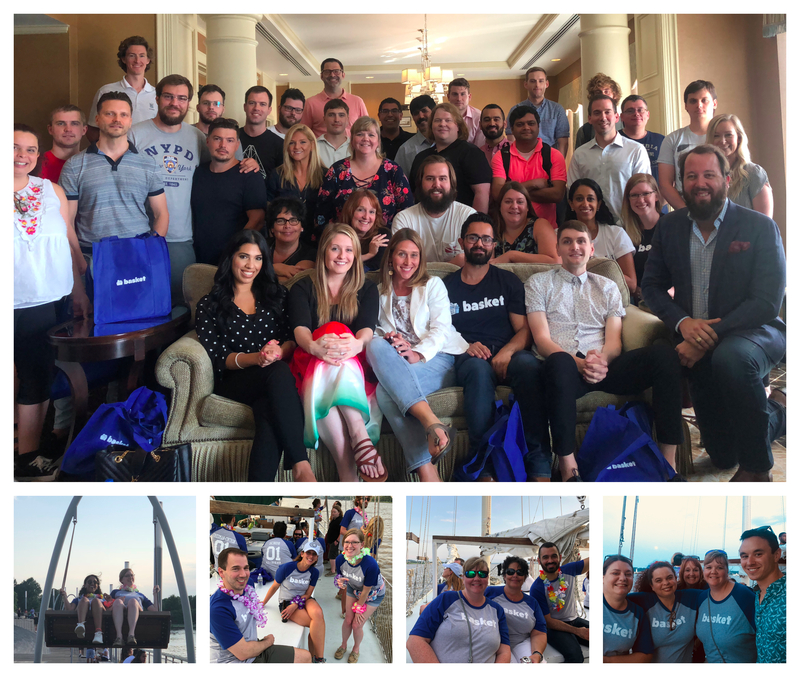 Team building and group outings have also been a big part of the Basket culture, from concerts and sailboat outings to happy hours and scavenger hunts. At the last team dinner, the number one rule was “no talking about work.” It helps you learn more about your coworkers, and cooperate with them better as well. For so many of us, our coworkers are more than just people we work with. They are friends. Truthfully, we don’t have gold-medal winning Olympians that competed at Pyeongchang or Sochi. Though we have a few snowboarders, skydivers and a yoga instructor, plus a kid’s lacrosse coach who is pretty intense. Instead, what we have at Basket are “Olympians” in their individual skills and backgrounds; multi-talented stars that go above and beyond every day – from engineering to marketing, from the community to sales. We have a lot of ambition and resourcefulness. And there’s that ever-present hustle. When Webber said to “Hire Olympians,” he meant to bring on board someone that is good enough to one day be your boss. Hire a star, help them grow and then let them take off. He noted that you shouldn’t be afraid to take that vacation, or get sick, and have things slow down. It’s your team that is going to keep the train running full speed ahead. We know that Basket is onto something that could disrupt the whole grocery industry. That’s a big deal. So Webber’s advice is to keep the forward charge and not let it slip. Keep the energy, the passion, and the nimble flexibility, to continue to bring innovation to the mostly antiquated grocery industry. Giving the shopper the power to make the right decision for themselves each time is the future of grocery… and we can never forget that. We only lose if we stop putting the shopper first. Webber ends his words of wisdom on success by saying: “Let’s go out there and crush it.” We might just have to frame that one on our wall next.